Meyer lemons, kale, and chard are among the many organically grown produce varieties available at the UC Santa Cruz Farm & Garden Market Cart and through the Farm's Community Supported Agriculture program. A member of the Apprenticeship in Ecological Horticulture stocks market cart baskets with organic produce. The cart opens June 7. 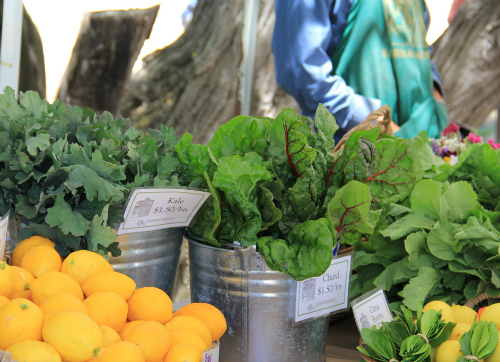 The Farm and Garden Market Cart at the base of the UCSC campus will be open from noon to 6 p.m. on Tuesdays and Fridays. Opening day, shoppers will find organically grown strawberries and blueberries, along with beets, spinach, lettuce, kale, and chard. Meyer lemons and flower bouquets will also be available. 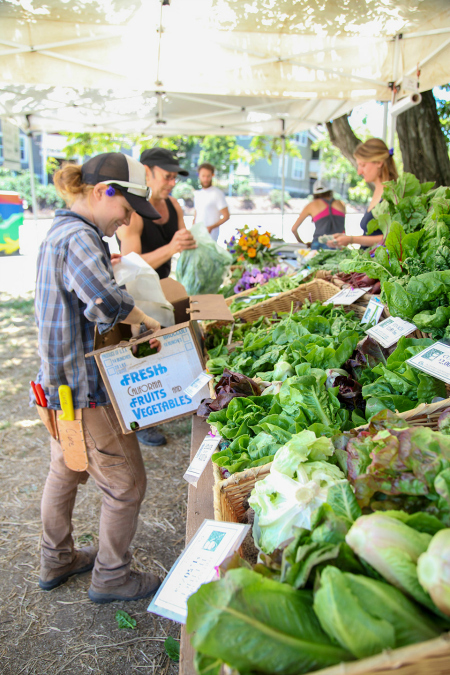 June 7 is also the opening of the UCSC Farm’s Community Supported Agriculture (CSA) program. Each week, members will receive a freshly picked box of organic produce from the UCSC Farm while supporting one of the nation’s longest-running organic farming and gardening training programs. The full CSA 2016 season runs for 22 weeks through November 4. Full-season shares cost $560. A payment plan is available as are limited-income shares at $280. The program also accepts SNAP/EBT benefits. A share of produce contains a diverse supply of freshly harvested organic fruits and vegetables throughout the season (roughly eight–13 items per week). New this year will be an optional flower share for an additional $10 per week for 10 weeks (late June through late August). Flower share members will receive one large bouquet a week, featuring seasonal blooms from the farm fields. Additional flowers can be purchased at the market cart farm stand. The market cart will be open through early November (weather permitting). As the season progresses, shoppers can look forward to heirloom and dry-farmed tomatoes, sweet corn, broccoli, potatoes, sweet and hot peppers, apples, pears, basil, winter squash, and more. The Farm and Garden will again offer a "late-season share" for $280, with pickups beginning August 16 and extending through November 4. Also new this year, CSA pickups will be scheduled on Tuesday and Fridays at the recently restored Cowell Ranch Hay Barn, with free parking in the hay barn lot. The hay barn is the new “front door” to the 30-acre Center for Agroecology and Sustainable Food Systems (CASFS) farm and represents both the campus’s respect for its past and its commitment to a sustainable future. From the hay barn, members can take a path through the Hay Barn Field to pick flowers and herbs at the former CSA pickup site at the top of the Farm. Pick-ups can also be arranged at the Westside Farm & Feed store on Swift Street on Tuesday afternoons. To sign up for the UCSC Farm’s 2016 CSA program, download and fill out the 2016 CSA Pledge Form (available at http://casfs.ucsc.edu/community/produce-sales/csa-brochure-and-pledge-form.html). Printed copies are available by calling 831-459-3240, or by email at casfs@ucsc.edu. All produce is grown organically at the UCSC Farm and Alan Chadwick Garden by staff and students in the Apprenticeship in Ecological Horticulture, the CASFS farmer and gardener training program. Proceeds from sales support the Apprenticeship program, now in its 49th year. Read more about the Farm & Garden’s produce and flower sales options at casfs.ucsc.edu/community/produce-sales/index.html For more information on CASFS activities at the UCSC Farm & Garden, see casfs.ucsc.edu. For questions or more information about the Center's Farm CSA project, including limited-income shares, call 831-459-3240. You can also email casfs@ucsc.edu, or write to UCSC Farm & Garden CSA, 1156 High St., Santa Cruz, CA 95064.